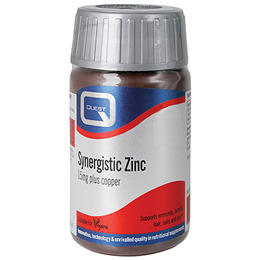 Quest Synergistic Zinc provides 15mg of Zinc and includes copper to maximise absorption. Can be used to support immune and skin health. Particularly recommended for men to help support fertility. Why use Quest Synergistic Zinc? Di-Calcium Phosphate, Mineral amino acid blend (providing zinc oxide, copper sulphate pentahydrate complexed with citric acid, glycine, hydrolysed rice protein), Bulking agent: Microcrystalline cellulose, Magnesium Stearate. Below are reviews of Synergistic Zinc with Copper - 90 x 15mg Tablets by bodykind customers. If you have tried this product we'd love to hear what you think so please leave a review.